With Christmas only 10 days away I have to admit I feel a bit blue that we won’t be travelling to Finland this year but I am grateful for all the wonderful memories from last white Christmas we spent with my family and friends. To reflect some of my feelings I’ve already started baking some Finnish Christmas pastries such as these Puffy Plum Pastries. 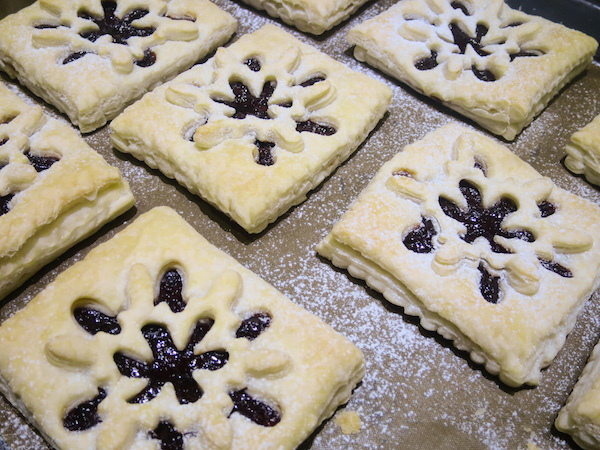 The traditional pastry is star shaped, made of a dough consisting of quark, butter and flour. My version this year is made with store-bought dairy free puff pastry squares. I did not give them an egg wash either so they are probably one of the first vegan pastries I’ve ever baked! And they are just as, if not even more delicious than the traditional ones! The traditional pastry is pinwheel shaped star with filling in middle. Finnish stores sell ready-made plum and apricot marmalades and jams especially intended for filling of these pastries. Now, of course I have no access to those ready-made fillings and trying to make them better for you – there is no added sugar in the filling! 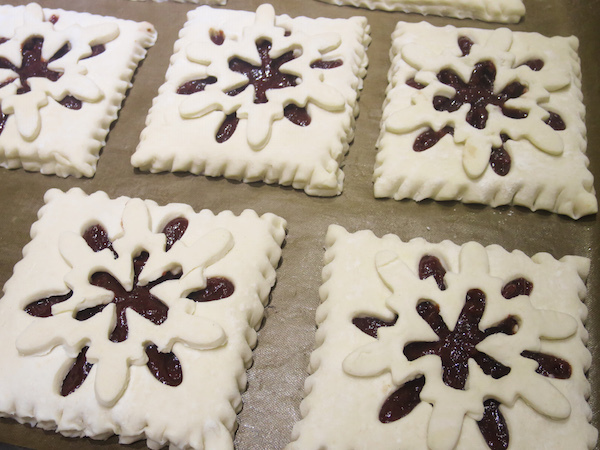 The snow flake design is easy to make with a snowflake cookie cutter. Your dough needs to be cold when cutting otherwise it will stick and especially the tiny parts can easily get reshaped as you take it off the cutter. With this design you need two pastry squares for one but can be more generous with filling as the pocket easily fits a spoonful and some. Place plums and water in a small sauce pot over medium heat and bring to boil. Boil for 10 minutes until the plums are soft and have absorbed most of the water. Add cinnamon and pulse in a blender until smooth. Preheated oven to 180°C (356°F) and place 10 puff pastry squares on a baking sheet prepared with parchment paper. Spoon generous amount of plum filling in the middle and spread until 5mm (0.2 inch) from the edges. 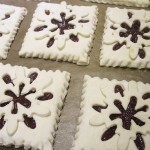 Keep the remaining puff pastry squares in fridge and work with design one at time as they melt fast in warm hands. Cut a snowflake (or any other design) from the middle by using a cookie cutter, then place the square on top of a square with filling and tap the edges to seal, you can do it with your fingers or for example by using sugar dough modelling tools. Place the cut out piece on top in a different angle. If your cutter has more than one cut out piece you may choose to discard a small piece to reveal more filling or use all positioning the pieces on top of each other. Bake in preheated oven for 25-30 minutes until slightly golden on top.